We’ve all been wondering how Kellyanne Conway gets to be that gorgeous. Us ladies just keep thinking that it’s really not fair…she has the beauty, the brains, and the money. 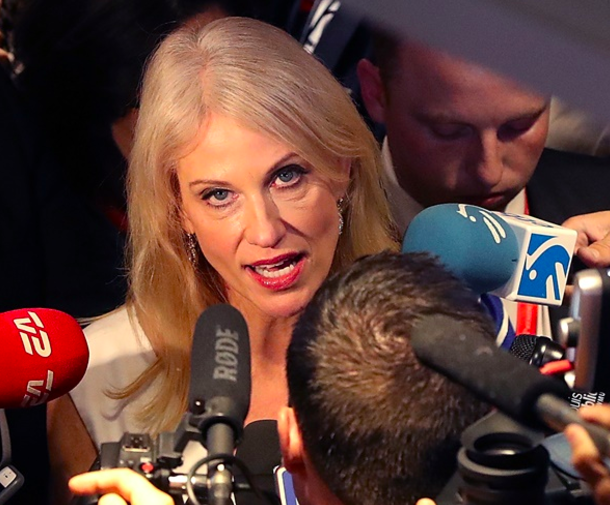 Recently, sources close to Kellyanne have revealed that she has a very strict makeup regimen to which she adheres every single day. So maybe she wasn’t born naturally flawless; let’s take a closer look. Jester: What do you start with? KC: So I actually moisturize with foot cream first thing in the morning, right after I wake up. KC: Well, regular moisturizer clogs your pores, you know, but foot cream…it really helps you get rid of those wrinkles, and it smells nice, you know? J: I see. So what comes next? KC: After the foot cream, I do my first round of foundation. The key with the foundation is to leave the bottle open in the freezer all night, so it gets very firm. Then you kind of just, break it onto your face and spread it around. The foot cream helps it settle. J: And after the foundation? KC: Then I add on my layer of bronzer. Donald and I actually share this. KC: Then, I put on my face powder. I actually used crushed up mud, dyed orange of course, to help my face achieve that perfect matte look. Then, I add on a layer of wrinkle cream. Not anti-wrinkle cream, mind you, but wrinkle cream. J: Why do you make this choice? KC: I think if I have enough wrinkles to make me look like a rotting corpse, it will give me a distinguished air, right? KC: Then, I start on my eyes, which is an extensive process. I have to put white foundation around my eyes so that they stand out, because a woman’s eyes are her best feature. And then, I rub in some light orange foundation onto that white so I don’t look like a total ghost, and then I coat my outer eyelids in black eyeshadow and eyeliner and mascara. I don’t actually put any of this stuff where it is “supposed” to go, because the media tells us we have these standards for eye makeup that we have to follow, but the media is the enemy of the American people. J: How do you make yourself look so skinny though? We are all dying to know! KC: I actually use this thing called bone cream, which really highlights and enhances the bones in my face so I look much skinnier. You can all buy this bone cream, in Ivanka Trump’s new makeup line, available at Nordstrom!